Notice how she’s sitting on a smaller popcorn tin. I really had no help in this! If my daughter could write, she would probably ask Santa for a drum set. There are four empty popcorn tins sitting under one of the desk in the office here at home. Usually she’s blocked off from coming back here as there’s way too much stuff she can get into. 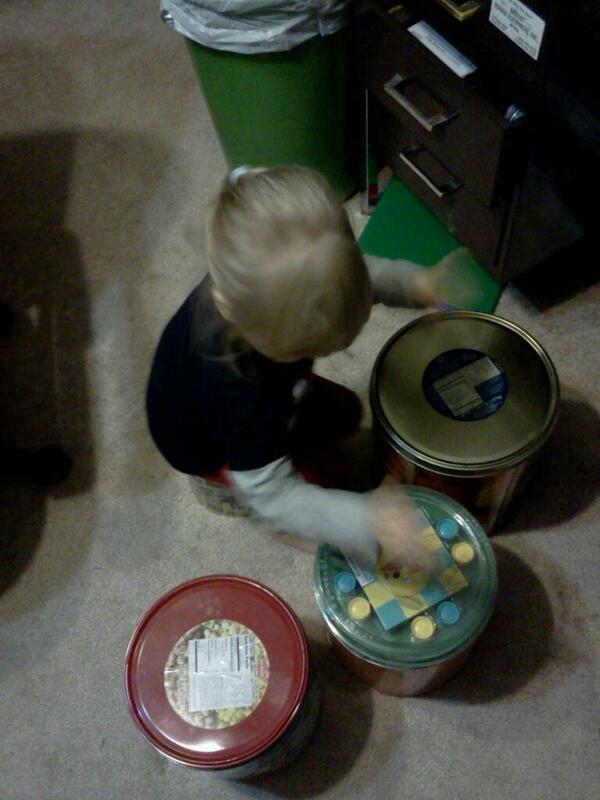 When she does come back here, either Grandma or myself is sitting here on the computer, she then helps herself to the tins, pulling them out and arranging them to the way she likes them, and starts hitting on them with her hands like a set of bongos. I may be biased, but I think she’s actually pretty good. Maybe she got the music gene from my side of the family. I know she’s drawn an interest to my Grandmother’s piano that sits in the living room. Every once and awhile Grandma or I will sit and play it; Dublin will come along and want to sit on the bench or in our laps and peck on the keys with us. At what age do you start putting a child into music classes? She can’t even read or write yet, let allow sit still for two seconds (she also gets that from me). I know that almost every child is drawn to music. A commercial comes on the television, playing music, and instantly my daughter will come from where ever she is, stand in front of the TV and start dancing. This entry was posted in Blog, My daughter and tagged children, Christmas, dancing with your toddler, drum sets, encouraging your child to dance, kids, Santa, single moms, single parents, smart toddlers on December 5, 2012 by JenniferNAdams. What a cute and loveable little girl. With music in her genes, I wouldn’t be surprised to see her making her own marks on the billboards someday. Congratulations. Thank you! I’m curious to see what she will do myself. I have a couple of acoustic and electric guitars and Gram’s has her piano, so there’s a start with a couple of musical instruments. Whatever she decides to do in life I’ll support her decision. My mom is a piano teacher – she usually has parents wait until children are around 4 or 5 for piano lessons, because their hands are just too small to stretch between the keys otherwise. But she had me in ballet starting at the age of 3, because it doesn’t matter how big or small you are for dance! That sounds about right for piano lessons and dance. I think I’ll wait until she’s about 5 and go from there. Thank you so much! 🙂 Wishing you and yours a happy 2013 as well!